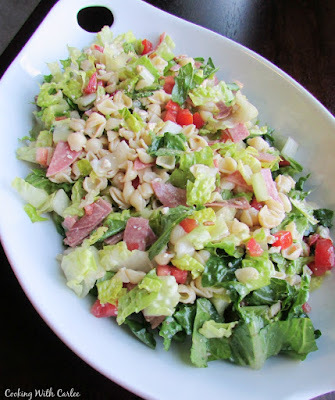 This chopped salad is perfect for a party! 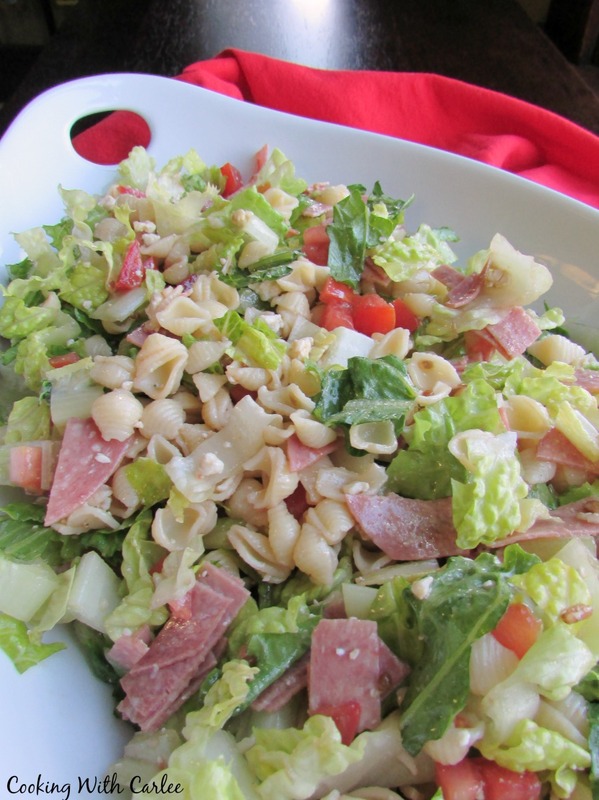 It is part pasta salad, part green salad and all yum! A simple dressing and all of your favorite ingredients will be great for dinner, a potluck or a BBQ! This salad is a little bit meaty of the leafy, cheesy, meaty salad we all love and a little bit pasta salad. All of the flavors come together wonderfully and this salad is sized for a party. Of course you can cut back and make it for a smaller group easily enough. I have made it for a few big gatherings at our house. I usually mix up the dressing the morning of the party. I also get all of the chopping done a couple of hours in advance. I leave the dressing off until right before it is time to serve. Sometimes I'll even only dress half of the salad at a time just in case we don't need it all. Since the rest isn't dressed, it keeps longer and can be my lunches during the week! Sometimes I like to make variations on this salad as well. It is great with a mix of bacon and salami. It is also great with hard boiled eggs or some smoked chicken, because why not? 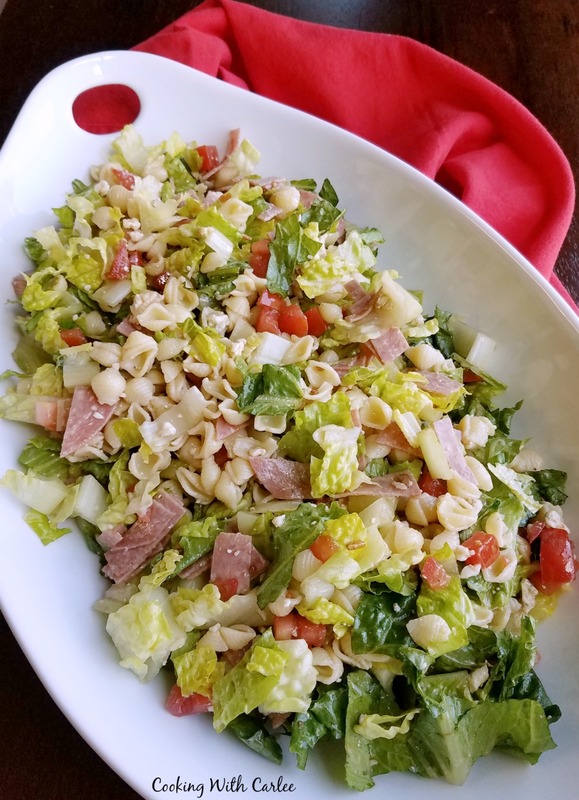 It has been a couple of years since I actually had a real Portillo's chopped salad, but this gives me a little taste of it when the craving strikes. To make it more authentic, you should use the ditalini pasta, some bacon and some chicken. I can't always find the ditalini pasta at my favorite grocery stores though, and the small shells work as a great substitute. Do you know what I need to do next? Work up a copycat for their poppy seed salad. It is loaded with fruit, chicken, cheese and a poppy seed dressing that is sooooo good. They make great Chicago style dogs and Italian beef as well, but I go straight for the salads every time! I actually poked around their website once to see what it would take to get a franchise. I think it would be really successful here. But, alas at last check they weren't offering franchises. Maybe they'll change their minds! Do you have a regional favorite restaurant that you wish you could bring home to your neck of the woods? What restaurant do you wish you had closer? 1. Mix together all dressing ingredients and refrigerate until ready to use. 2. Chop all salad ingredients small. Toss together. If making ahead of time, cover and refrigerate until ready to serve. 3. Toss salad and dressing just before serving. Yum, yum, yum! I love a good salad, and this one looks like it fits the bill. I can't wait until I can have cold lunch meat again (pregnant here, so trying to stay away). Thanks again for linking up with Idea Box! Congratulations! It is funny the things you miss while you are pregnant, but better safe than sorry. Or sub bacon! Another fab dish from you. Today I'm over from Funtastic Friday. Would be great at a party. Thank you! It was really good... I added a little fresh lettuce to the leftovers and they were pretty good the next day too! Oh damn, I thought I'd already commented but wasn't sure but realise now will visible after approval, lol! This is a fantastic salad for our large crowd. Thanks so much for sharing with Full Plate Thursday and have a wonderful weekend. It goes really far! 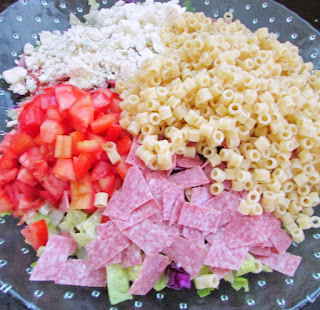 It is fun because it is part pasta salad and part lettuce salad. Thanks for stopping by and have a great weekend! This looks so delish! I love chopped salads. Thanks for linking up and sharing with us at Funtastic Friday. I hope you can make it again this week. I love chopped salads. Thanks for linking up and sharing with us at Funtastic Friday. I hope you can make it again this week. Me too! A little bit of everything in each bite and no need to have everything perfectly arranged! Thanks for hosting! Guess what, they are building a Portillos in our area, I'm so excited. I love their chop salad and now I can recreate it!! Yay!!! Now I must have a hot dog with it, ha!! happy weekend sweetness!! NO FAIR!!!! I actually really did some digging to see what it would take to franchise one, but last I checked that wasn't an option. Maybe some day! Love this! I make some type of salad each week during the summer for our family and this will have to be on our menu soon! What a great idea! I need to get in the routine of more salads during the summer too! Wehave a block party - this looks like something new beyond those same old pasta salads! This would be perfect for a block party! Lol.. I wish every and any restaurant was closer to me!! This would be a good salad to make up on Sunday's and divide out for the week, and then just put the dressing on before eating! That would be perfect! I would say the same, but we go out to eat so seldomly that our patronage wouldn't count for much! But it doesn't hurt to dream anyway! This looks like a great salad, and I am always looking for larger portions as we enjoy get together with family and friends. I don't have to look any further as this is perfect! Thanks for sharing your great recipes! We tend to host a lot of big gatherings and I don't mind leftovers, so go big or go home ;-) Thanks, Amy!